S100 protein is the largest subtribe in calcium binding protein family. According to recent researches, abnormal expression of S100 protein is often related to tumor, including breast tumor. Breast tumor is the most common malignant disease in female with high mortality mainly due to metastasis. Estimating early diagnostic and prognostic markers are helpful to conduct treatment for patients with breast cancer. Accumulating investigations focused on the role of S100 proteins in breast tumor development and metastasis. This paper summarizes the expression situation of S100 proteins in breast tumor as well as its effects on metastasis and prognosis of breast tumor. Ovarian cancer often occurs in perimenopausal women. The mortality of ovarian cancer is in the first place among gynecological cancers because of no obvious early symptoms and the lack of effective diagnostic approach. Gene chips, proteomics, immunohistochemistry and other methods have become hot topics for early diagnosis of ovarian cancer. However, due to the variety of pathology and not clear enough of mechanism and etiology, there is still no ideal tumor markers with both high specific and sensitivity, which can be applied into clinical early diagnosis for ovarian cancer. Therefore, a new systematic method with high sensitivity and specificity for early diagnosis of ovarian cancer and new tumor markers need to be identified. We should make an examination of ovarian cancer in the early period in the crowd for early diagnosis and early treatment to further improve life quality of patients. This paper reviewed the recent advancements of tumor markers for early diagnosis of ovarian cancer. Objective: Lung cancer has become the primary cause of cancer-related death now. New therapies targeting the molecular regulatory machinery were required imperatively. MicroRNAs and long noncoding RNAs can respectively or cooperatively function as oncogenes or tumor suppressor genes in human cancers. The present study identified that miR-449a was down-regulated in tissue of human lung cancer. 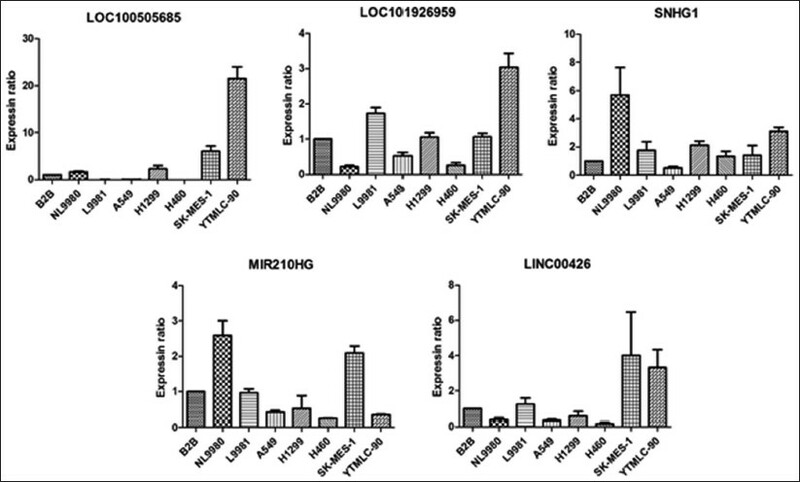 In this study, we aimed to investigate the function of miR-449a in NL9980 and L9981 lung carcinoma cells lines and the relationship with lncRNA nuclear enriched abundant transcript 1 (NEAT1). Materials and Methods: miR-449a was profiled in several lung carcinoma cell lines by quantitative reverse transcription-polymerase chain reaction RT-PCR. We analyzed the effects of miR-449a overexpression on proliferation, apoptosis and cell cycle in L9981 cells. The regulatory relationship between miR-449a and NEAT1 was predicted in silico and further studied by miR-449a inhibitor and mimics assay. Results: miR-449a was expressed in four cell lines, which we selected, however miR-449a was in high level in NL9980 and in low level in L9981 (P < 0.05). 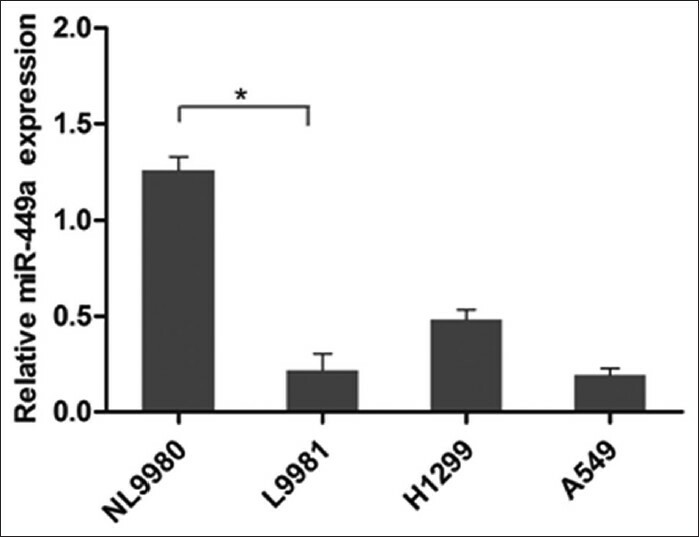 When the miR-449a was the overexpression in L9981 cells, the cell growth was suppressed, and the apoptosis cells were promoted compared with the control group (P < 0.05). The G1/G0 became longer and S, G2/M became shorter (P < 0.05) by miR-449a overexpression. Further study of the interaction between miR-449a and NEAT1 show that NEAT1 was up-regulated when cells were transfected with miR-449a inhibitor, and NEAT1 was down-regulated when cells transfected with miR-449a mimics. Conclusions: Our data indicate that miR-449a may function as a suppressor of lung cancer, and affects the expression of NEAT1 in lung cancer cells. 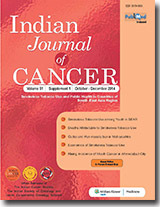 Objective: The aim of the present study was to evaluate the efficacy and safety of pemetrexed chemotherapy combined with intrapleural injection of pemetrexed and bevacizumab in the treatment of malignant pleural mesothelioma (MPM)-mediated malignant pleural effusion, and analyze the objective response rate (ORR), the median progression-free survival (PFS) and the median overall survival (OS). Methods: We analyzed the clinical data of 23 MPM patients with pleural effusion who were treated with a combination chemotherapy of pemetrexed at 500 mg/m 2 , on day 1 plus cisplatin (DDP) at 20 mg/m 2 on day 1-5 of each 21 days cycle, and concurrently, intrapleural injection of pemetrexed 0.5 g and bevacizumab 300 mg was administered on day 3 or day 4 after complete effusion drainage. ELISA test was applied to detect the vascular endothelial growth factor (VEGF) level in the pleural effusion and serum, and assess the ORR and survival. Results: In the 23 evaluable patients, the VEGF level in the pleural effusion and serum was significantly decreased, P < 0.01, pleural effusion of 20 patients (86.96%) was controlled effectively. There were 8 complete responses, 7 partial responses, 5 stable disease and 3 progressive disease, the ORR was 65.21%, the disease control rate was 86.96%, the median PFS was 6 months, the median OS was 14.5 months, and the 1-year survival rate was 41.22%. Toxicities were generally mild and manageable; the major toxicities included myelosuppression, fatigue, and anemia, mainly were grade 1-2 which could be managed by symptomatic treatments. Conclusion: The combination of pemetrexed chemotherapy with intrapleural injection of pemetrexed and bevacizumab is efficacious and safe for MPM pleural effusion, and results of the present study demonstrate some improvement in the PFS and OS. The expression of VEGF in the pleural effusion and serum plays a guiding role in monitoring the efficacy of bevacizumab in the treatment of malignant pleural effusion. Background: The extent of the benefit of gefitinib in the treatment of advanced nonsmall-cell lung cancer (NSCLC) is till controversial, when compared with docetaxel. We performed this meta-analysis to compare the efficacy and toxicity of gefitinib with docetaxel for different patients with advanced NSCLC. Materials and Methods: We searched PubMed, Cochrane Library, and identified 5 randomized controlled clinical trials published within 2000-2013. After further full-text screening, 4 clinical trials were included in the final meta-analysis. Results: The outcomes of treatment efficacy included progression-free survival (PFS), overall survival (OS) and objective response rate (ORR). Comparing gefitinib to docetaxel for advanced NSCLC patients, the pooled hazard ratio (HR) of PFS was 0.91, (95% confidential index [CI] = 0.83-0.99), the pooled HR of OS was 1.02, (95% CI = 0.93-1.13), the pooled risk ratio of ORR was 1.57, (95% CI = 1.01-2.47). Conclusions: Gefitinib was found to significantly improve patients' PFS and response rate compared with docetaxel. There is no difference of OS between gefitinib and docetaxel. Background: Ovarian cancer was one of the most diagnostic cancers for women and leading cause of death from gynecologic cancer. Most of the cases were at advanced stage when diagnosed. Platinum-based regimen was considered as the firs-line chemotherapy treatment modality. But most of the cases developed recurrence or resistance to platinum. The aim of this retrospective study was to evaluate the activity and toxicity of bevacizumab combined with chemotherapy in the treatment of recurrence or platinum-refractory ovarian cancer. Materials and Methods: Totally, 37 ovarian cancer patients with complete data who treated with bevacizumab combined with chemotherapy were reviewed from the databases of Beijing Cancer hospital and included in this retrospective study. All included patients received >1 cycle of bevacizumab based combination therapy with eligible for the efficacy and toxicity assessments. The objective response rate (ORR) and toxicity were recorded and evaluated according to the Response Evaluation Criteria in Solid Tumors (RECIST) National Cancer Institute's Common Toxicity Criteria. Results: The ORR and disease control rate were 32.4% and 54.1% respectively by the RECIST criteria and 43.2%, 67.6% by CA125 criteria. 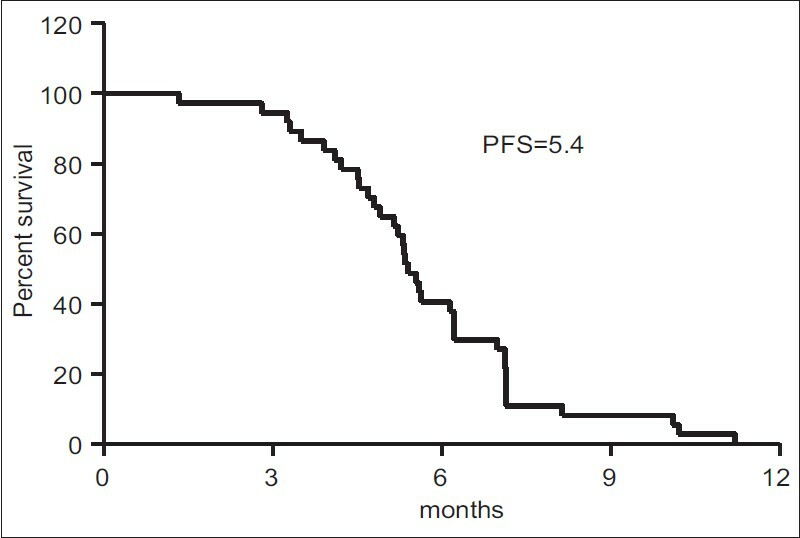 The median progression-free survival for the 37 cases was 5.4 months with its range of 2.3-11.2 months. The two complete response patens had longest disease-free survival interval with one for 10.0 months and another for 11.2 months. The total grade III-IV hematologic toxicity and nonhematologic toxicity were 8.1% and 21.6% respectively. Conclusions: With acceptable toxicity and relative well clinical activity, the bevacizumab combined chemotherapy can be a potential treatment modality for the recurrent or platinum-refractory ovarian cancer. Introduction: Angiogenesis plays an important role in the biology of ovarian cancer. The clinical efficacy and side effects of bevacizumab, the vascular endothelial growth factor inhibitor, on survival and toxicity in women with this ovarian cancer, was not conclusive. We performed this systematic review and meta-analysis in order to clarify the efficacy of bevacizumab combined with chemotherapy in the treatment of ovarian cancer. Materials and Methods: We searched the electronic database of MEDLINE, EMBASE, Cochrane Central Register of Controlled Trials and CNKI for clinical controlled trials of comparing bevacizumab combined with chemotherapy and chemotherapy alone in the treatment of ovarian cancer. The primary outcomes of eligible studies included median progression-free survival (PFS), overall survival (OS), and toxicities such as enterobrosis, hypertension, albuminuria, congestive heart failure (CHF), neutrophils, thrombosis, and bleeding. The Hazard ratio (HR) and relative risk were used for the meta-analysis and were expressed with 95% confidence intervals (CIs). All the statistical analyses were carried out by Stata 11.0 software (http://www.stata.com; Stata Corporation, College Station, TX, USA). Results: We included 5 studies with 1798 cases in the bevacizumab combined with the chemotherapy group and 1810 subjects in the chemotherapy alone group. 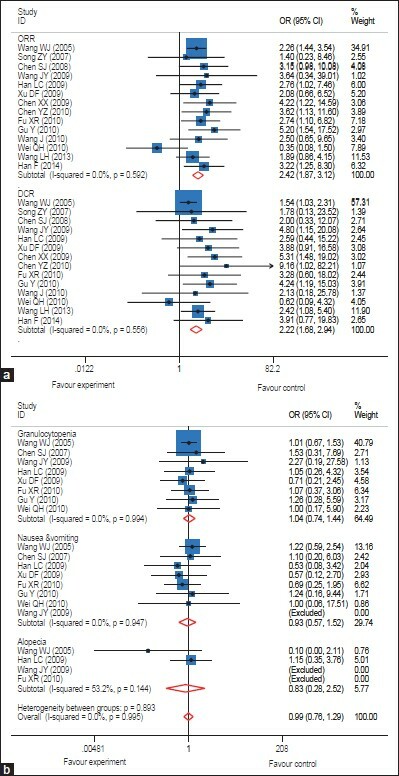 The pooled results showed that bevacizumab + chemotherapy compared with chemotherapy alone can significant prolong the median PFS (HR, 0.64; 95% CI, 0.46-0.82; P < 0.05) but not the OS (HR, 0.84; 95% CI, 0.59-10.9; P > 0.05); the toxicity analysis showed that the enterobrosis, hypertension, albuminuria, neutrophils, thrombosis, and bleeding were significantly increased in the bevacizumab + chemotherapy group compared with chemotherapy alone (Pall < 0.05). 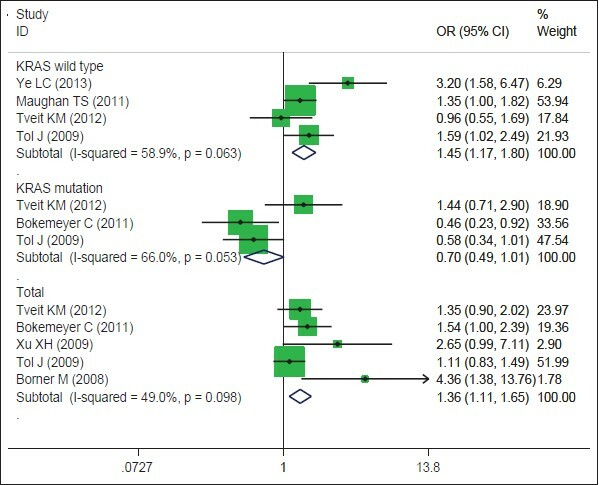 But the CHF risk between the two groups was not statistical different (P > 0.05). Conclusion: Bevacizumab combined with chemotherapy prolonged the median PFS in patients with ovarian cancer but also increase the risk of developing enterobrosis, hypertension, albuminuria, neutrophils, thrombosis, and bleeding. Background: Nonsmall cell lung cancer (NSCLC) is the major cause of cancer death worldwide. Increasing evidence shows that noncoding RNAs (ncRNAs) are widely involved in the development and progression of NSCLC. ncRNA small nucleolar RNA host gene 1 (SNHG1) has not been studied in cancer, especially its role in lung cancer remains unknown. Our studies were designed to investigate the expression and biological significance of SNHG1 in lung cancer. SNHG1 may be a novel ncRNA in early diagnosis in lung cancer. Methods: Noncoding RNA SNHG1 expression in 7 lung cancer cell lines was measured by quantitative real-time polymerase chain reaction. RNA interference approaches were used to find the biological functions of SNHG1. The effect of SNHG1 on proliferation was evaluated by cell count and crystal violet stains. Results: Noncoding RNA SNHG1 expression was significantly upregulated in lung cancer cells when compared with normal bronchial epithelial cells. In addition, in vitro assays our results indicated that knockdown of SNHG1 inhibited cell proliferation. Conclusions: Our data indicated that ncRNA SNHG1 is significantly upregulated in NSCLC cell lines and may represent a new biomarker and a potential therapeutic target for NSCLC intervention. Background: Bevacizumab, a recombinant humanized monoclonal antibody that blocks angiogenesis by inhibiting vascular endothelial growth factor A, was described to be effective in the treatment of recurrent or platinum-resistance ovarian cancer. The present retrospective study was performed to further evaluate the clinical efficacy and toxicity of bevacizumab in the treatment of Chinese recurrent ovarian cancer patients who had been previously treated by platinum-based chemotherapy. Materials and Methods: We reviewed the hospital database and finally included 26 recurrent ovarian cancer patients who were treated with bevacizumab combined with gemcibabine or paclitaxel or single agent. All included patients received >3 cycle of bevacizumab treatment. The tumor response, overall survival, and toxicities were documented. Results: Under the treatment of bevacizumab combined with gemcibabine or paclitaxel, 2 complete response (7.7%), 8 partial response (30.8%), 7 stable disease (26.9%) and 9 progression disease (34.6%) was documented with the objective response rate of 38.5% and disease control rate of 65.4%. The median overall survival from the first application of bevacizumab was 15.3 months [Figure 1] for all of the 26 patients. The median overall survival time was 16.2 and 14.0 months for bevacizumab + gemcitabine and bevacizumab + paclitaxel treatment schedule respectively. 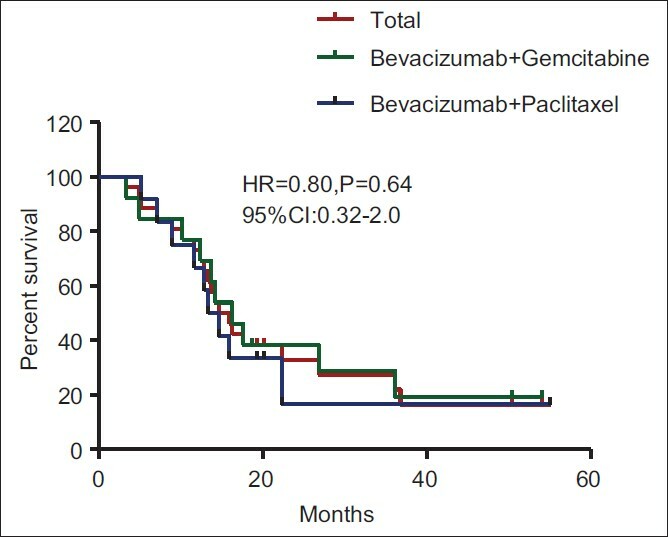 The overall survival was not different between bevacizumab + gemcitabine and bevacizumab + paclitaxel treatment regimen hazard ratio = 0.80 (95% confidence interval: 0.32-2, P = 0.64). The hypertension and proteinuria were the major bevacizumab related toxicities. Conclusions: Bevacizumab combined with gemcibabine or paclitaxel was a promising treatment schedule for platinum-resistance recurrent ovarian cancer. Introduction: Lung cancer is the leading cause of cancer-associated death world-wide. And the lung cancer is generally divided into small cell lung carcinoma and non-small cell lung cancer. For advanced NSCLC, the chemotherapy and target therapy were the important treatment modality. This meta-analysis was to evaluate the clinical efficacy and toxicity between endostar combined chemotherapy and chemotherapy alone in Chinese patients. Materials and Methods: We searched the PubMed, EMBASE, and CNKI databases to find the potential relevant articles reporting the endostar combined with chemotherapy regimen in the treatment of nonsmall cell lung cancer in Chinese patients. The tumor response and toxicity difference between the two groups were demonstrated by odds ratio (OR) and its 95% confidence interval (95% CI). All the data was pooled by Stata 11.0 (http://www.stata.com; Stata Corporation, College Station, TX) software. Results: We included 14 studies published in Chinese or English studies. The pooled results showed adding endostar in the chemotherapy regimen can significant increase the objective response rate (OR = 2.42, 95% CI = 1.87-3.12, P = 0.00) and disease control rate (OR = 2.22, 95% CI = 1.68-2.94, P = 0.00). For toxicities, the pooled data showed no statistical difference for grade III-IV granulocytopenia risk (OR = 1.04, 95% CI = 0.74-1.44, P = 0.83). Nausea and vomiting (OR = 0.93 95% CI: 0.51-1.52, P = 0.78) and grade III-IV alopecia (OR = 0.99, 95% CI: 0.76-1.29, P = 0.95). The funnel plot showed no statistical publications. Conclusion: Combined treatment with endostar can improve the response rate for NSCLC patients without increasing the risk of developing severe adverse event. Background: Colorectal carcinoma is one of most diagnosed solid malignant carcinoma. The chemotherapy combined with target drugs in the treatment of advanced colorectal cancer in not conclusive. 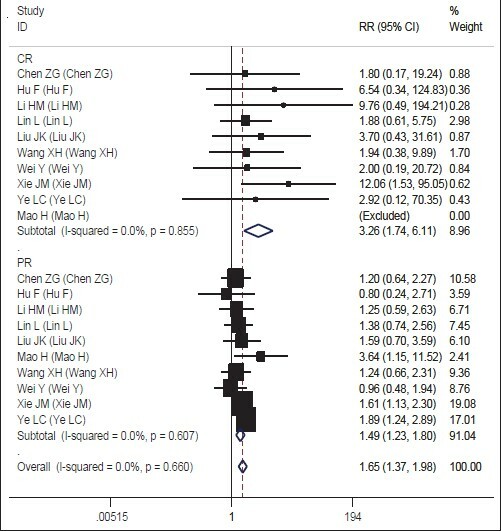 Methods: The clinical studies reporting the activity and adverse events between chemotherapy alone versus chemotherapy combined with anti-epidermal growth factor receptor drugs were screened in the databases of Medline, the Cochrane Library, Wanfang and CNKI and included in this meta-analysis. The risk ratio (RR) and its 95% confidence interval (CI) for treatment response and adverse events were pooled by random or fixed effect model. Results: A total of 10 clinical studies reporting chemotherapy combined with the target in the treatment of advanced colorectal cancer were included in this study. The pooled RR was 3.26 (95% CI: 1.74-6.11, P < 0.05), 1.49 (95% CI: 1.23-1.80) and 1.65 (95% CI: 1.37-1.98) for complete response (CR), partial response and objective response rate, respectively. For nausea and vomiting events, the RR was 1.62 (95% CI: 1.33-1.97, P < 0.05) indicating higher incidence of nausea and vomiting was observed in the combined group compared with chemotherapy alone. However, the diarrhea (RR = 1.10, 95% CI: 0.86-1.42, P > 0.05), liver function damage (RR = 1.03, 95% CI: 0.74-1.42), myelosuppression (RR = 1.04, 95% CI: 0.83-1.31) and neurotoxicity (RR = 1.12, 95% CI: 0.93-1.35) were not different between the two groups. Conclusion: For Chinese patients with advanced colorectal cancer, chemotherapy combined with target drug can improve the response rate, but also increase the risk of nausea and vomiting. Background: Oxaliplatin based chemotherapy regimen was one of the most used chemotherapy modality for metastatic colorectal cancer. 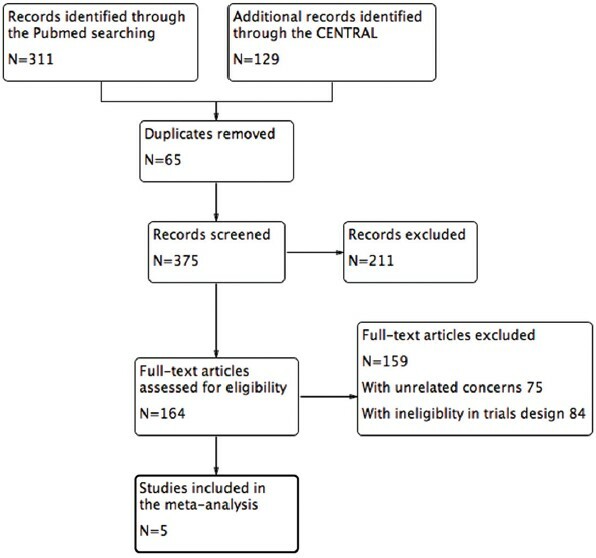 The purpose of this meta-analysis was to assess the clinical activity and toxicities of cetuximab plus oxaliplatin-based chemotherapy regimen for metastatic colorectal Cancer. Methods: We searched the clinical studies about the cetuximab plus oxaliplatin-based chemotherapy regimen versus oxaliplatin-based chemotherapy alone for metastatic colorectal cancer in the databases of PubMed, EMBASE, Cochran, and CNKI. The data of response and toxicities were extracted and pooled by random or fixed effects model. 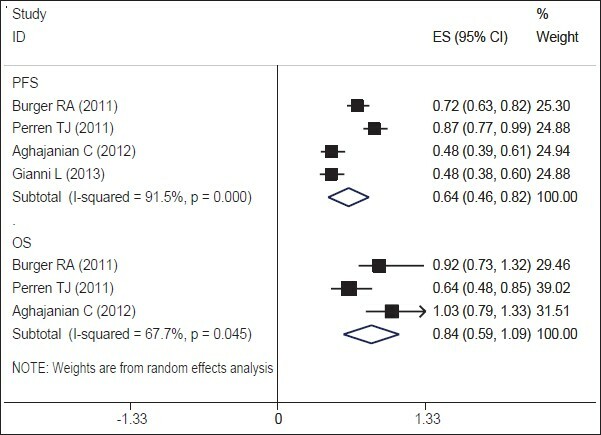 And publication bias was evaluated by begg's funnel plot and egger's regression test. Results: Seven papers were included in this study. Adding cetuximab to oxaliplatin-based chemotherapy regime can significant increase response rate in K-RAS mutation metastatic colorectal patients (odds ratio [OR]: 1.45, 95% confidence interval [CI]: 1.17-1.80, Z = 3.38, P = 0.001) and metastatic colorectal patients without knowing the K-RAS status (OR: 1.36, 95% CI: 1.11-1.65, Z = 1.89, P = 0.003). But for patients with mutated K-RAS, the improvement for objective response rate was not statistical significant (OR: 0.70, 95% CI: 0.49-1.01, Z = 3.00, P = 0.058) when adding cetuximab to oxaliplatin-based chemotherapy regime. The pooled results indicating the rash and diarrhea risk was significantly increased in the combined treatment group (P < 0.05). The toxicity of peripheral neuritis was decreased by adding the cetuximab (P < 0.05). And other toxicities were not statistical different between the two groups (P > 0.05). Significant publication bias was found in toxicities evaluation. Conclusion: Cetuximab plus oxaliplatin-based chemotherapy regimen significant increase the response rate for metastatic colorectal cancer. But the some toxicities such rash and diarrhea risk was also increased.